Since the construction of the magnificent organ of Notre-Dame des Neiges in Alpe d'Huez, in 1978, reknown in France and abroad for the quality of its musical architecture and the originality of its case, the Association Notre-Dame des Neiges - Orgues et Montagnes has been dedicated to the organisation of numerous musical activities in this beautiful ski resort, also well known for its sports and cultural events. Orgues et Montagnes organises concerts, each week during the winter and summer months, and also offers summer training courses of organ, Pan's pipe and singing. The weekly concerts, which take place each Thursday of both seasons, attract large audiences to recitals by the best French and foreign organists and, also duets of organ with various other instruments as well as choir and orchestra groups. Thanks to its unusual placement in the centre of the church, the organ is visible to the entire audience and, for many of those who attend our concerts, they are true discoveries of this often little known instrument. 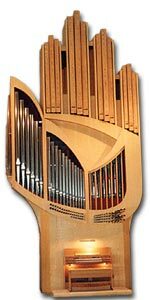 The organ's summer course, directed by Jean-Paul Imbert, is open to organists of all ages and qualification to learn and practice in the quiet and tranquillity of a mountain village. During their course session, they are invited to play in the Thursday concerts. The Pan's pipe and singing summer courses are directed by Cornel Pana and Chrisitan Ciuca. You are invited to visit our site to learn more about our activities and, hopefully, attend our concerts and course sessions.